Today was truly an awe-inspiring day! Time seemed to stand still in my house as I was glued to the TV. I couldn't turn away, I couldn't stop crying, nodding my head, rocking back and forth, spontaneously clapping! Part of me wished I had stayed at school to watch the Inauguration on the big screen with Nate. Or gone to my friends party and shared in the collective euphoria of Hope. But the other part of me needed to absorb the immensity of the moment in a quiet, personal way. The Dream has come true, change has come. Things will start to be different now. . .The People Have The Power! "Yes We Can!" I had planned to watch the Inauguration in the morning and then proceed with my checklist for the day; the dishes, the laundry, the groceries, the Resume! And then it sucked me in. It was polarizing. I watched every minute detail, from Bush's departure, to the luncheon to the preparations for the parade. It wasn't a matter of avoiding my chores, I wanted to get outside of myself - to be a part of the bigger picture! This is History, this is HUGE! At 2-o-clock it hit me that I should draw something. My friends have been urging me to pick up a pencil and just draw! 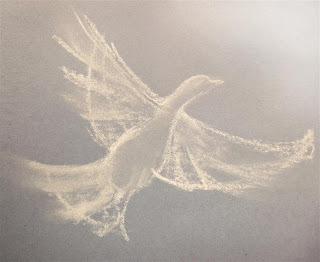 The first and only image that came was a dove. Flight, Freedom, Peace. It's corny I know, probably even a little generic -but it's all I had. I have to pick up Nate at 3, so I had an hour. I ended up spending most of that hour looking for my pastels in the basement! Out of desperation that I would miss my window, I found a piece of chalk and did a quick sketch. I drew something. I'm starting. "In today's sharp sparkle, this winter air, anything can be made, any sentence begun. On the brink, on the brim, on the cusp -- praise song for walking forward in that light."